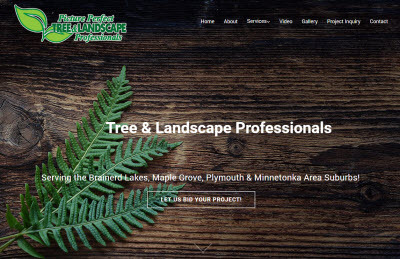 Picture Perfect Tree Service joins the legions of tree services in Minnesota and elsewhere, of all sizes. Most tree services are a guy or two and a truck and related equipment. They all do the same kind of things: tree removal, tree trimming, stump grinding, landscaping and other related services. This company out of Randall, MN did some work for BAMsites and in return, we set up a nice website for them. They did not have any kind of internet presence previously, but recognized the need. We grabbed a WordPress Theme that fit the bill and quickly put it together. The owner is Rick Drew. He’s also the guy who literally ran up a couple of pretty tall trees in my yard and made quick work of them; sectioning off the large branches and trunk, and completely cleaning up afterward. You couldn’t tell they were even here! As I write this blog, the site’s been up for two weeks and is on page 3 of Google for “Brainerd Tree Removal“. It should move quickly, the way I have it set up. I’ve been using the same SEO techniques for years now, and they always work to bring prominence to my sites, especially in a regional market like the Brainerd area.